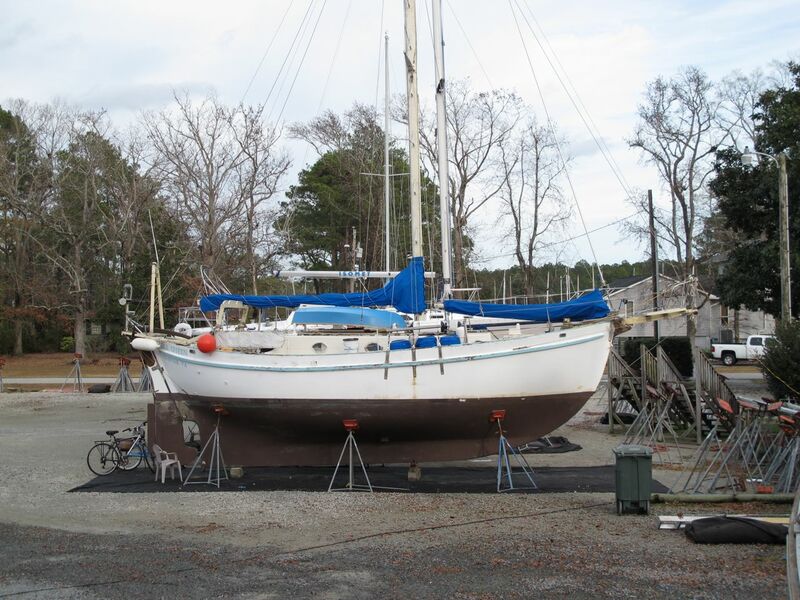 Idle Queen is currently hauled out of the water at Deaton Yacht Service in Oriental, NC, for a major refit that will include work on the rigging, hull, and many of the systems. The major goal of this refit is to make sure that the hull and rigging are in good condition. It has been a while since Idle Queen last had a major refit, so there are quite a few jobs to catch up on. The thing that worried me the most during last year’s sailing was the rig. The chainplates were showing plenty of signs of corrosion, leaving rust streaks down the hull. They were leaking inside the boat, so water was definitely making its way past the fasteners. What I discovered after removing them was worse than I had expected. The hull’s core had not been sealed where the bolts fastened the chainplates to the sides of the boat, and over the years it had absorbed water leaking past the sealant. When I pulled the bolts out, water began draining from the open holes. I immediately knew that wasn’t a good sign, but when it was still leaking a couple of days later, I knew that I was going to be in for more than just making new chainplates. I first had to find the extent of the saturation, so I started by scraping out around the holes as best I could. The scraping brought forth more foul-smelling water. At least the core wasn’t mushy. Rather, it still felt solid and fibrous even though it was saturated and dark-colored. I thought about trying to make a repair from inside, but there was no way I could stay on the boat while doing major interior fiberglass work, and I would have had to demolish the interior from the main bulkhead to the galley to access the problem area, so I decided to attack it from outside. If I’d had a place to stay and somewhere to offload all my gear from the boat, it might have been easier to have removed the inner skin to repair the core, even considering the demolition and reconstruction of all the shelves, etc. So, I started drilling from the outside. Each new hole was made a few inches farther from the chainplate area until I hit dry core in all directions. Water poured out of some of the holes like I had drilled into the bottom of a bucket. In the end, I had a repair area of about 6 feet by 3 feet on each side of the boat. I hated to do it, but the only way to get a good repair was to cut off the outer skin, remove all of the wet balsa and plywood, and then rebuild the area with new core and glass. So, I committed myself by cutting the outline of the repair area and beginning to pry off the outer skin. I thought this part would be pretty easy, but I was amazed at how tenaciously the balsa was bonded to the skins! I couldn’t remove the outer skin without destroying it; I had to resort to cutting it off in little pieces only a few inches square. Even using an air-powered chisel did little to make the job go faster–the balsa just absorbed almost all the energy imparted by the tool. This process made me feel a lot better about balsa-cored construction, that’s for sure. It was truly difficult take this part of the boat apart! Where there was plywood core I was able to remove the outer skin with relatively little effort.